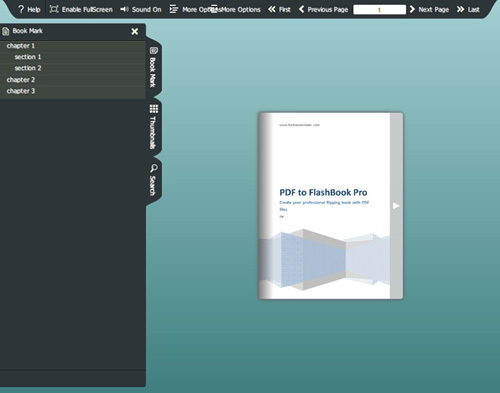 Q: Is that possible to define the initial show of the page flip manual? I made a flash flipping manual of my product and attach to the pack. To make the manual clearer to users, I have to do something to the initial show of it, like book marks. But some of them told me that turn the manual page by page to find a section is inconvenient, and asked me are there any bookmarks or something----obviously, they neglected the bookmark button. So is there a way to emphasize that bookmarks are here? 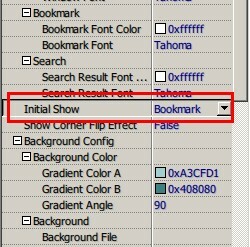 Oh, yes, you can show the bookmark initially by setting the “initial show” of your flipping pages. In “spread” templates, find “initial show”, default is “none”, click it and you can see “bookmark” and “thumbnails”, choose “bookmark” and apply change, the book initial show will like below. Also, you can choose “thumbnails” to show thumbnail initially.